I’m always in search of a tasty new appetizer recipe because to me, making spinach and artichoke dip every time I entertain starts to get old after a while. So when I’m looking for a new recipe that is intended for minis or individual portions, I always look to Cara over at Cara’s Cravings. Cara always seems to be cooking up something new for a baby shower or wedding rehearsal dinner that she’s catering and I know from following her blog for almost 2 years now that she’s always got something up her sleeve. 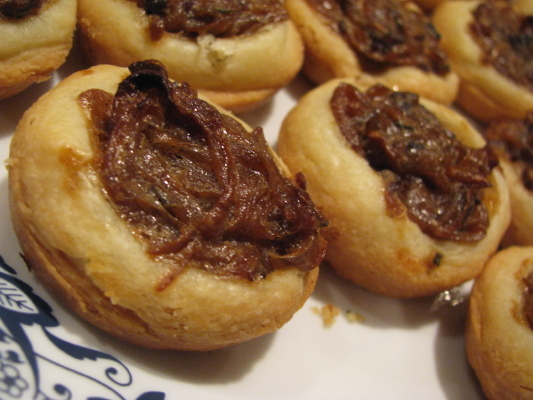 So when I came across her caramelized onion with bacon and sage tartletts, I knew I found what I was looking for. And, I knew that I wanted to add a little extra to it. Being the cheese whore that I am, I often feel like an appetizer recipe isn’t complete without some type of cheese. This case wasn’t any different. 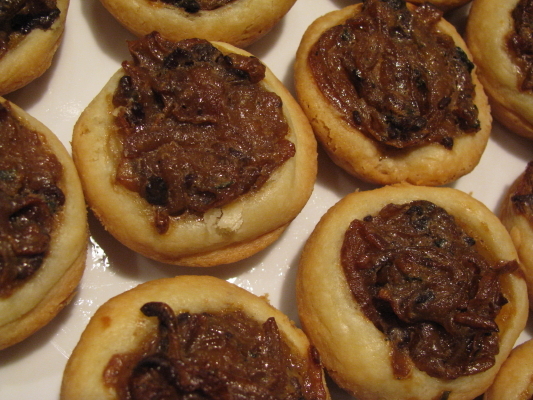 I popped a little piece of brie (rind removed) into the bottom of the tartletts and covered it with the onion mixture. Loved it…and next time, I’ll add a larger piece of brie because it kind of got lost under all of the onions. Overall, these tartletts were simple to put together. The dough was literally a 3 step process – with no food processor required. The onions do take a while to cook down but it is essential to cook them low and slow as to not burn them. I prepped everything ahead of time in CT and packaged up the onion mixture and the dough and brought everything down to my parents’ house on LI where I assembled them Saturday night. Simple enough. I halved the recipe without issue (except that I used 1 1/2 tablespoons of balsamic vinegar instead of 1 1/2 teaspoons which actually worked out fine because the vinegar sweetened as it cooked) and it yielded 17 tartletts. I do recommend cooking them for an additional 2-4 minutes rather than the 20 minutes indicated. Heat a large nonstick saucepan over medium heat and cook the bacon, stirring often, until almost crisp. Add the onions, sugar, and salt, and cook, stirring often until they cook down by two-thirds, about 10 minutes. Add 2 teaspoons vinegar, reduce the heat to medium-low, and continue to cook until the onions are an even golden brown and softened to a marmalade consistency, 30-45minutes, depending on the onions. Stir often and scrape up any brown bits clinging to the bottom of the pan. The onions need almost constant stirring near the end to prevent them from sticking and burning. They’ll let you know they need attention by giving off a sizzling sound. Stir in the sage, allow them to cool slightly, then taste and season with black pepper and additional salt if needed. If the onions seem overly sweet, stir in another teaspoon of vinegar. 1. Blend cream cheese and butter. Stir in flour and salt just until blended. Roll into little balls and place in greased mini muffin tins; you should get 36. Using a tart shaper, press dough into muffin tins to form little shells, flouring the tart shaper when necessary. Chill for about 1 hour. 2. Preheat oven to 325 degrees F. Stir cream or half and half into onion mixture. Place a piece of brie in the bottom of each tartlett. Divide filling evenly among chilled tart shells. Brush edges of tart dough with egg wash.
3. Bake until filling is set and dough is lightly browned; about 20 minutes. Cool and remove from pans. Serve warm or at room temperature. Notes: These can be frozen in a single layer and then transferred to a plastic freezer bag. To reheat these kind of appetizers at my parties, I usually keep the oven on at about 400F with cookie sheets inside, so they are constantly kept warm. I warm up frozen appetizers as necessary by just placing them on the hot cookie sheets for about 10-12 minutes. This works for any kinds of little tarts, mini quiches, potato pancakes, mini turkey burgers, or fried wontons, etc, that have been cooked and frozen.